Pablo Picasso Published by the artist. In-4vo, (32 x 24,2 cm), stapled, 23 pages, cover printed in black on the front. First edition, very scarce. 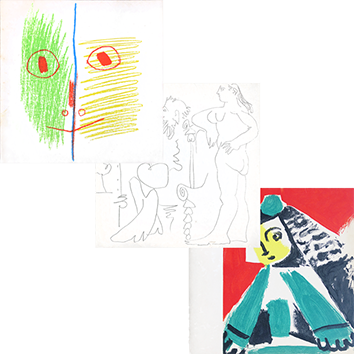 Fac-simile of the manuscript of the play "Le désir attrapé par la queue", written by Pablo Picasso in 1941. Published by the artist at very few copies (less than 50) reserved to his close friends. On a blank page the artist has pasted a collage with the dedication "Pour Inès" (Sassier) in red and blue pencil. 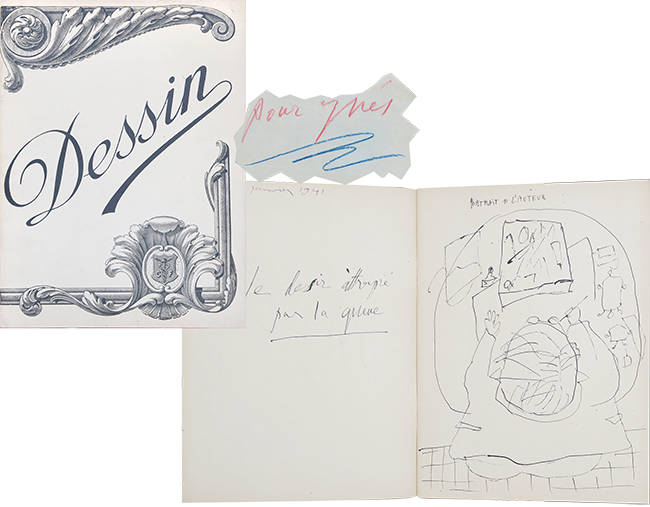 Reference : Dictionnaire Picasso, Robert Laffont, 1995 ; G. Latour, Les Extravagants du théâtre, pp. 329-332. In very good condition.